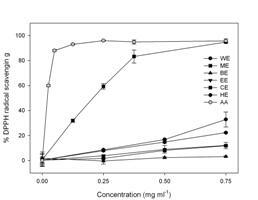 The aims of this study were to examine the efficacy of extracts of Hemicentrotus pulcherrius (Echinodermata: Echinodea) egg as an anti-browning agent. The anti-browning candidates were screened using DPPH radical scavenging assay. The effects of DPPH radical scavenging were increased with increasing amount of the extracts. The methanol extracts displayed remarkable effect of DPPH radical scavenging. Anti-browning activity was evaluated by monitoring the change of L*, a*, b* values and total color differences (?E). It was found that methanol and water extract effectively inhibited browning in apple juice at a concentration below 0.1% (1.0 mg mL-1). However the other extracts did not show anti-browning effects in apple juice. Sea urchin egg extracts could be of good resources as anti-browning agents. The results suggest that our study may contribute to the development of new and natural anti-browning agents with potential applications to reduce oxidative damage.